Syracuse, Everson Museum of Art and New York, Martha Jackson Gallery, My Five Years in the Country, March-June 1972. no. 5 (illustrated). River III belongs to the first group of painting that Mitchell executed when she moved permanently to France. In 1968, the date of the painting's execution, she moved into a two-acre estate owned by Claude Monet from 1878 to 1881 in Vétheuil, located north of Paris. Mitchell was at once inspired by the views of the landscape and gardens as well as the river Seine nearby, which also moved Monet to capture them on canvas. "Since her earliest visits to Vétheuil, the river Seine has provided a fruitful subject for Mitchell's art. Her painted river represents a composite of feelings associated with memories of real rivers and other bodies of water. Mitchell's paintings of rivers dating from 1967-68 exhibit opaque, loosely brushed, roundish areas of blue or green floating on large luminous white grounds" (J.E. 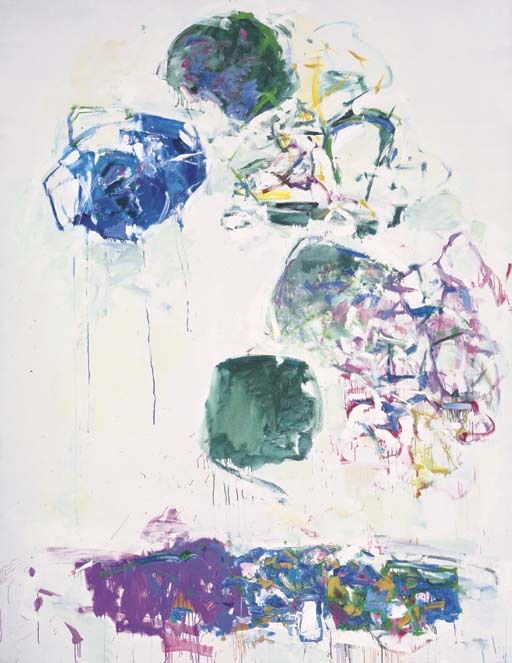 Bernstock, Joan Mitchell, Ithaca, 1988, pp. 76-77). Like Monet, Mitchell sought to convey a pastoral idyll in her landscape paintings, where nature is held in perfect equilibrium of sky, land and water. In the present painting, Mitchell depicts these elements as abstract circular configurations that seem to rise and descend like the rhythms of the natural world. Instead of painting a literal view of the river Seine, Mitchell drew upon her personal response to the landscape and created a picture of intense subjectivity. The colors are pure and brilliantly contrasted between cool and warm tones. Mitchell's brushstrokes contain a kind of sensitivity and lushness which are unique to her works. The Marieluise Hessel Collection consists of over one thousand works of painting, sculpture, photography, works on paper, videos and video installations from the late 1960s to the present, and documents the rise of late twentieth century issues in art and culture such as identity and multiculturalism. Over the years, Ms. Hessel has assembled a collection with museum quality depth while retaining the personal imprint of a passionate, private collector. She continues to build and expand the Collection, keeping it vibrant and forward thinking. In 1990, Marieluise Hessel provided funding for the creation of the Center for Curatorial Studies at Bard College, and two years later placed her collection on permanent loan in the Center's newly built, 38,000-square-foot exhibition and research facility. The works in the collection are available for study by graduate students, scholars, and guest curators at the Center and for use in the students' masters degree exhibitions. The Center also houses a research library with more than 15,000 volumes, and an extensive archive on contemporary art, both of which were initiated by gifts from Ms. Hessel. Additionally, the Center contains classrooms, offices, advanced collection storage facilities, and 9,500 square feet of galleries. The mission statement of the Center for Curatorial Studies calls for an innovative, interdisciplinary graduate program to teach and train curators and critics of contemporary art. The Center draws curators, artists and scholars from all over the world to teach. It has already produced a generation of curators working at prominent museums, galleries and universities around the world, and graduates concentrating in art criticism have compiled impressive publication credits. In its short life, the Center for Curatorial Studies has already become an influential training ground, and as the first program of its kind in the United States, has in recent years been a role model for other related courses of study emerging in American colleges and universities. The works included in Christie's Post War and Contemporary Evening Sale are either similar to masterworks in the Collection, or pre-date its more contemporary purview. Proceeds from this sale will go towards funding archival projects at the Center for Curatorial Studies, the acquisition of new works, expansion of the current facility and building new exhibition space.